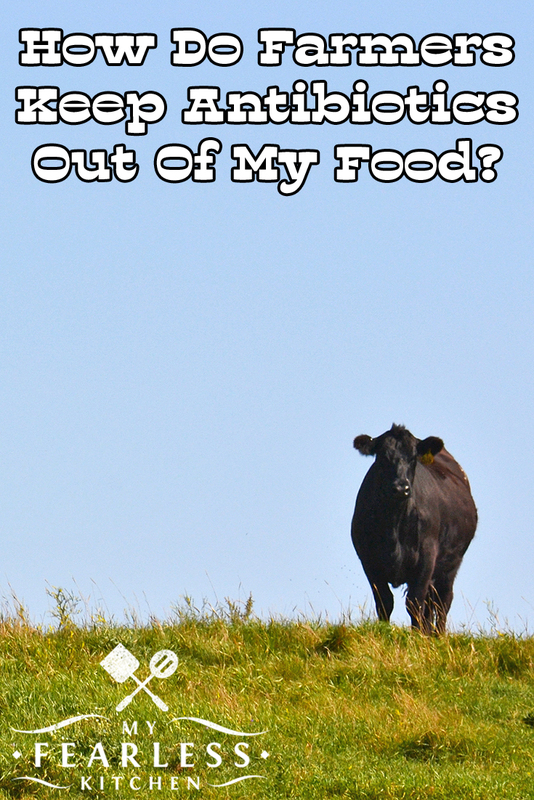 You are here: Home / About Farming & Food / How Do Farmers Keep Antibiotics Out Of My Food? When farmers use antibiotics to keep their animals healthy, they must follow strict rules and use the medicines appropriately. Find out how these requirements keep antibiotics out of your food. Farmers feed the same food to their families that you eat. Whether they eat the meat they raise on their farm, or go to the local butcher shop or the grocery store like you do, we are all eating the same food. Farmers want to keep the food they raise safe and antibiotic-free for you and for their own families. John and I are veterinarians, and we raise beef cattle. If anybody can get “cheap” antibiotics, it’s us. Even though we have the knowledge and access to use antibiotics easily, I can count on one hand the number of times that we have given antibiotics to our cows in the last 9 years since I joined the farm. In fact, I’m pretty sure that it has been 4 times… once to a cow after a difficult C-section to save her calf, once to a young bull with diarrhea, and twice to sick calves. Four times in 9 years, and only to animals who really needed them. To treat animals when they get sick. To help control the protozoa in a cow’s rumen so she can use nutrients better. No matter what reason farmers give antibiotics to their animals, they must always follow the label instructions, keep records, and be vigilant about the withdrawal period for the antibiotic. Farmers also work very closely with veterinarians (like me and my husband) to make sure that they are using the right antibiotic, in the right dose, for the right reason. Using antibiotics “just because” is a big waste of time and money. 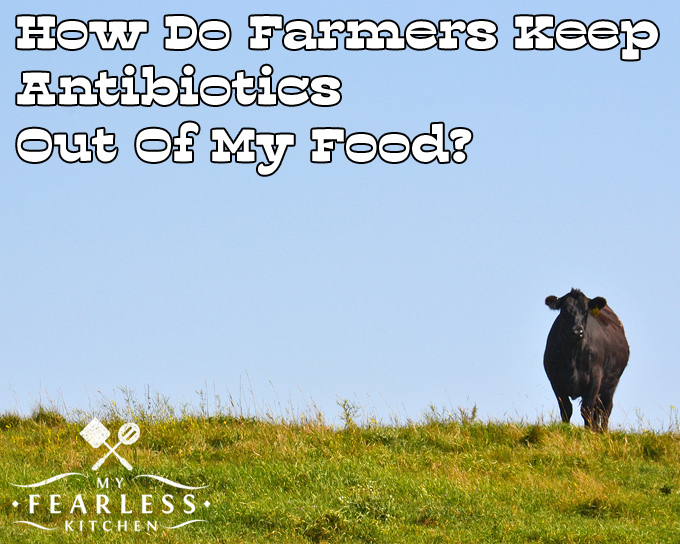 How Many Antibiotics Do Farmers Use? There are some crazy statistics about how many antibiotics are used in animals compared to how many are used in people. For the most part, those statistics don’t make much sense. Let’s look at just one antibiotic, penicillin. Penicillin is an antibiotic that is used in both people and animals. The dose of injectable penicillin for an adult is 200,000-500,000 Units per person. Let’s take the high dose, and call it 500,000 Units. The dose of injectable penicillin for a cow is 44,000-66,000 Units per kilogram. Again, let’s take the high dose, 66,000 Units per kilogram. For easy math, let’s say the cow weighs 990 pounds (that’s a small cow). So the cow weighs 450 kilograms (990 pounds times 2.2 kilograms per pound = 450 kilograms). Then we multiply 450 kilograms times 66,000 Units per kilogram. The dose of injectable penicillin for this small cow is 29,700,000 Units. I know, that sounds like a lot. A person gets 500,000 Units of penicillin, and a cow gets 29,700,000 Units of penicillin. Both doses are right, and both doses are effective in treating bacteria that are sensitive to penicillin. Let’s go back to that statistic that 80% of the antibiotics that are sold are used in animals. Even if it were true (which it isn’t), can you understand that now? Just looking at penicillin, a person gets less than 2% of the amount of penicillin that a cow gets. Strictly looking at antibiotic doses and body weights, it makes sense that animals get more antibiotics than people do. And antibiotics are not cheap. Many people are used to only paying their co-pay at the pharmacy, so you may not know how much antibiotics really cost. Some (like penicillin) are not very expensive. Others can be hundreds of dollars for a bottle. Using antibiotics in animals that don’t need them is just a waste of money. « How Do I Know There Are No Antibiotics In My Food?